If you find corrosion (green powdery substance) on the battery terminals, replacement is recommended. TIP: If the corrosion is minimal, try using a Q-Tip dipped in a liquid mix of baking soda/water or Coca Cola to clean the battery contacts. You must remove all the corrosion and avoid getting the solution(s) on anything but the effected area. After cleaning put a light film of dielectric grease on the connectors to slow down the opportunity for corrosion to re-appear. The NFPA recommends the detector(s) be tested monthly. Press the test button which should briefly activate the audible horn. It should reset itself shortly. Residential grade smoke alarm/detectors are not repairable, if they fail to operate properly through testing, they should be replaced. Limited long-term test data exists, but manufacturers and trade associations indicate the product should remain properly functional for 10-12 years under normal conditions. In 1998 the US Consumer Product Safety Commission associated 15,600 household fires to clothes dryers. Many of these fires can be related to lint build up in the dryer exhaust duct. This number may not appear to be significant, but the potential loss for anyone would be. A full load of clothes contain about 1/2 gallon of water. Lint is created as a by-product of removing the water from the clothes. Even though many would believe the lint filter in the dryer takes care of most lint concerns, they would be wrong. Pulling out your dryer from the wall after about a month of use will reveal lint that did not get caught by the dryer nor did it make it through the vent duct but escaped outside the duct system. Besides the items mentioned above, you may have installation or design issues that may be causing your dryer not to operate properly. Take a look at these items for a more in-depth inspection. Excessive Duct Length: The International Mechanical Code, article 504.6 and 913 defines a maximum length of 25 ft. For each 45 degree turn, reduce that number by 2.5 ft. and 5 ft. for each 90 degree turn. If your dryer is not on an outside wall and the dryer duct is routed through the attic or under the house you probably have two 90 degree turns. If you include the vertical distance (attic or basement) with two 90 degree turns, you have an approximate budget of 9-13 ft. from the rear of the dryer to the outside wall (this is not very far). Excessive distance may cause buildup to occur more rapidly. The diameter of the pipe should be 4 inches. If you can’t change the distance, inspect and clean the duct more regularly or consider adding a booster fan. Excessive Vertical Distance: Pushing this air up has its limitation. (see the Whirlpool document listed below for back pressure requirements). If your system exceeds the vertical hight of one story (8 ft.) you may need to measure the back pressure with a manometer and consider a booster fan for adequate dryer ventilation. System Integrity: Visibly walk (or crawl) the entire duct where it is exposed (attic, crawl space, basement, etc.) to ensure all fittings are tight, secure, straight and clear not crimped or bent up. TIP: Performing this function while the dryer is running will help find problems quicker. PVC Piping: The use of PVC (plastic) pipe should be avoided completely as excessive heat can melt the plastic (PVC will melt at 140 F). Besides the temperature issue, PVC has a tendency to create static electricity that can contribute to the build up. If PVC is used, consider having it replaced with ridged metal duct work. Plastic or Thin Flexible Connection Duct: This would be the “transition” ducting to connect the dryer to the wall outlet. A ridged solution is the best but many times a flexible duct is required due to the lack of space. There are dozens of choices even though the big orange box may only have two. You may have to use the internet to find the best product for your requirement. 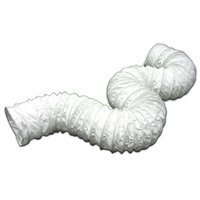 Check out Fixitnow.com as a great source to review your duct options. Avoid the plastic or thin foil slinky type at all costs. If you need one that is flexible, find a simi-flexible non-kinking type. If you find the plastic or thin foil type in your system, replacement is recommended. Try to find one with a UL listing on the packaging. Kinks, Tight Bends & Rough Interior Surfaces: A smooth free flow path with minimal bends and turns is the most ideal installation. The entire duct system should be metal: Otherwise you may have excessive static electricty. Make sure there is continuity from end to end from the dryer to the outside vent, 3) Ensure the dryer is correctly grounded, 3) Check the grounding of the AC Breaker panel, 4)Make sure there are no plastic fittings or section in the system. By having a properly grounded dryer and the metal vent is connected to the dryer, the static electricty will have a good path to ground. In 1999 the US Consumer Product Safety Commission reported of the 15,000 house fires studied, electric dryers were over 2.5 times more likely the cause of the fire over a gas dryer and that the most frequent locations were the dryer vent and lint trap. Clean lint screen/ filter before each use: This is mandatory, running the dryer with a clogged filter screen will force the dryer to push the air and lint into other places, such as in the interior of the dryer as well as the laundry closet area. Clean under and around the dryer: Pull the dryer away from the wall or out of the it space and clean the floor and walls and underneath the dryer. Perform this yearly. Dryer interior space: You will have to make this call regarding your experience to perform this item. With the dryer disconnected from the wall (electric plug and duct), remove the inspection plate on the rear of the dryer. Inspect for excessive lint and remove with a vacuum cleaner. Inspect as often as yearly, but every three years may be sufficient. Remove and clean the transition duct: If you can remove this, take it outside and use a vacuum cleaner, compressed air or water hose to throughly clean this out. NOTE: if you use water, get it good and dry before you replace it. Normally once a year should work. Clean the dryer duct (in-wall): There are a dozen ways to do this, but I like the “Chimney Sweep” type product. Using a portable drill attached to the device, you can run this through the pipe and it will scrub out all the lint. I like to do it from the outside with the dryer running (yes it makes a mess) but it does a great job. If you don’t want to invest in the tool, consider hiring a professional. The worst thing you could do is getting something stuck in it, which would put you out of business and make matters worse. Inspect this once a year and clean it as required. I use the LintEater and found it to be an excellent product with great instructions and a hand full of accessories for the everyday homeowner. Its about $35. Specific codes that define the use of dryers and the installation of venting duct work include but not limited to: International Mechanical Code, article 504.6 and 913, UL 2158 par. 7.3, ANSI Z21.5.1 Gas Dryers as well as local codes and ordinances. This Whirlpool link provides a nice detailed vent specification as well as pressure measurements if you are building a new dryer vent system and need to provide a contractor the specifics. You are currently browsing the archives for the Safety Items category.